Fifa has banned its former secretary-general Jerome Valcke from all football-related activity for 12 years. The governing body's independent ethics committee also fined the 55-year-old 100,000 Swiss francs (£70,800) after it investigated allegations of misconduct relating to sales of World Cup tickets. During the inquiry, other acts of potential misconduct arose concerning travel expenses and regulations. Valcke's lawyer said his client had done "absolutely nothing wrong". The lawyer's statement said: "With today's decision, the Fifa ethics committee has shown that it is not a credible, independent or objective decision-making body. "In reaching an entirely unsupported, unjust and politically motivated decision, it wholly ignored the uncontroverted and exculpatory evidence that had been presented to it. "Mr Valcke is confident that when all the facts come out, it will be clear that he did absolutely nothing wrong in carrying out his duties for the good of Fifa and the sport." 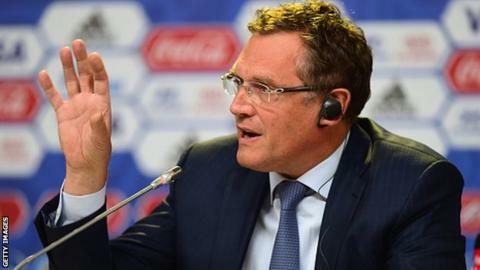 In September last year Valcke was put on leave and released from his duties until further notice after Fifa had "been made aware of a series of allegations" involving him. His dismissal was confirmed in January and Fifa recommended he be banned from football for nine years. Regarding the 12-year ban imposed on Friday, a Fifa statement said: "Amongst other things, the adjudicatory chamber found that a sports marketing firm had gained an undue advantage from the selling of World Cup tickets. "In this respect, not only did Mr Valcke do nothing to stop these activities, he even encouraged the persons responsible to do so. "By travelling at Fifa's expense purely for sightseeing reasons, as well as repeatedly choosing private flights for his trips over commercial flights without any business rationale for doing so, Mr Valcke gained an advantage for himself and relatives. "In doing so, Mr Valcke acted against Fifa's best interests and caused considerable financial damage to Fifa. "Concerning the issue of TV and media rights for the Caribbean, it was found that Mr Valcke attempted to grant the TV and media rights for the 2018 and 2022 World Cups to a third party for a fee far below their actual market value and had taken concrete preparatory action in this regard. "Furthermore, it was found that Mr Valcke deliberately tried to obstruct the ongoing proceedings against him by attempting to delete or deleting several files and folders relevant to the investigation, despite being aware of his duty to preserve all data and to collaborate in order to establish the facts of the case." In December last year, Fifa president Sepp Blatter and Uefa boss Michel Platini were suspended for eight years from all football-related activities following an ethics investigation which concluded they had demonstrated an "abusive execution" of their positions.